It’s Mixology Monday time again, our favorite post of the month. This month’s theme is courtesy of JFL over at Rated R Cocktails, one of our favorite tiki themed blogs. The theme this month is Spoooooooky cocktails. JFL was very liberal in his definition of spooky; garnish, appearance, tribute to a horror icon, you name it. Read on to find out what we came up with. Nose: Lime, hay, vegetal agave notes. Hints of smokey mesquite, pomegranate, caramel. Palate: Sweet lime, pineapple, and pomegranate to start. Mid-palate is smokey vegetal and mineral flavors with a rich sweet rum base. More pomegranate on the finish with dry lemon peel and pith, and a lime bite at the very end. Aftertaste is smokey and faintly sweet, like burnt toffee. There you have it, a mezcal tiki drink, and a yummy one at that. We weren’t sure if the mezcal would work, but it did (or at least we like it :)). Thanks to JFL for hosting this month, and for a fun (and seasonally appropriate!) theme. Also, thanks as always to our torch bearer Fred Yarm. Until next week, cheers! 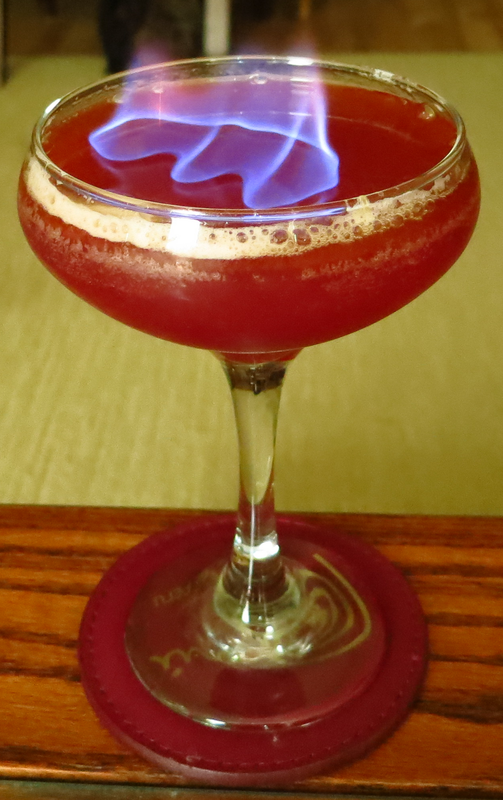 This entry was posted in 151 rum, gold rum, grenadine, lemon bitters, lime juice, mezcal, pineapple juice and tagged funeral pyre cocktail recipe, Mixology Monday. Bookmark the permalink.